Dr Marek Zbik, from Queensland University of Technology’s Science and Engineering Faculty, studied the unusual morphology and internal structure of bubbles within lunar regolith impact glasses using traditional scanning electron microscopy and the novel technique of transmission X-ray microscopy (TXM), with 3D tomography reconstruction. Vesicles within the lunar glasses are filled in with submicron-sized particles that consist of glass nano-size elements. Nano tomography is a transmission X-ray microscope which enables 3D images (video above) of nano particles to be made. “We were really surprised at what we found,” Dr Zbik said. 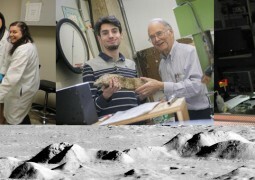 The research revealed a previously unknown phenomenon of building a highly porous cellular structure within bubbles in glassy particles of the dust fraction of lunar regolith. The TXM tomography reconstruction anaglyph demonstrated cellular-like, 3D structures, where oblique glassy fine particles down to 100 nm in diameter built chains of sophisticated network. “Instead of gas or vapor inside the bubbles, which we would expect to find in such bubbles on Earth, the lunar glass bubbles were filled with a highly porous network of extraterrestrial glassy particles that span the bubbles’ interior,” Zbik said. Unlike Earth, the moon has no atmosphere to cushion the impact of meteorites. Submicron and nano-sized grains present in lunar regolith could have formed inside bubbles of molten rocks when meteorites hit the lunar surface. Then they may be released when the glass bubbles are pulverized by the bombardment of meteorites on the moon’s surface. Nano particles behaved according to the laws of quantum physics which were completely different from so called ‘normal’ physics’ laws. Because of this, materials containing nano particles behave strangely according to our current understanding. “We don’t understand a lot about quantum physics yet but it could be that these nano particles, when liberated from their glass bubble, mix with the other soil constituents to give lunar soil its unusual properties,” Dr Zbik said. Lunar soil is electro-statically charged so it hovers above the surface; it is extremely chemically active; and it has low thermal conductivity (eg it can be 160 degrees Celsius above the surface but -40 degrees Celsius just two meters below the surface). It is also very sticky and brittle such that its particles wear the surface off metal and glass. Liberated particles are permanently enriching lunar soil in the finest soil constituent. This unusual constituent of lunar regolith and its properties must be better understood before any permanent lunar exploration begins. Dr Zbik and his research team’s study was published in the International Scholarly Research Network Astronomy and Astrophysics. Ref: Marek S. Żbik, Yen-Fang Song, Chun-Chieh Wang, and Ray L. Frost, “Discovery of Discrete Structured Bubbles within Lunar Regolith Impact Glasses,” ISRN Astronomy and Astrophysics, (2012), Article ID 506187, 3 pages.